Metallic Rebel LTE $204,825, ridden by Beau Galyean for Thomas Guinn, Philadelphia, Miss., set a new Lucas Oil NCHA Super Stakes Classic Open record with a 229-point win on Saturday, April 1. The 5-year-old red roan stallion was bred by Alvin and Becky Fults, Amarillo, Tex., who own his sire, Metallic Cat. CR Tuff Lucy LTE $302,785, shown by John Mitchell for Glade Knight, Weatherford, Tex., scored 224 points for the reserve championship. The 6-year-old mare was bred by Center Ranch, who owns her sire, Woody Be Tuff. Button Down Supercat $235,116 scored 222 points under Wesley Galyean, for third place. The 6-year-old daughter of Dual Rey is owned by SMF Cutting Horses LLC, Aspen, Colo. The NCHA Super Stakes Classic is the third championship for Metallic Rebel and Galyean in 2017. They also won the Abilene Spectacular 5/6 Open and the Arbuckle Mountain 5/6 Open. In 2016, they racked up wins in the Ike Hamilton Futurity, the Pacific Coast Derby, the Pacific Coast Cutting Stakes, and the West Texas Derby. Metallic Rebel is out of Sweet Abra LTE $117,725, by Abrakadabracre, and full brother to three individual earners of $100,000-plus: Sweet Metallic LTE $130,962, Magic Metallic LTE $128,165, and Magistic Moon LTE $106,217 – all also bred by Fults and trained and shown by Galyean. Metallic Cat, from three crops to show, was the leading sire of NCHA money earners in 2016 and is on track as leading sire in 2017. He has more than $1 million in progeny earnings already this year. 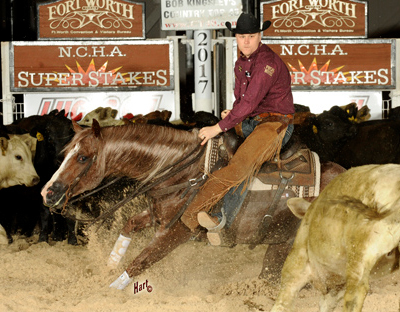 Beau Galyean, a member of both the NCHA Non-Pro and the NCHA Open Riders Halls of Fame, and 2008 NCHA Futurity Open champion aboard Metallic Cat, is the NCHA earner of $2.9 million.